A mere four days on from the Iceman’s cultured drive to victory in the opening Australian Grand Prix, the Formula 1 circus is already on the road again for round two; this time in balmy Malaysia. Kimi’s cool head and placid demeanour will be needed ever more at a circuit renowned by many drivers as being one of the physically toughest on the nineteen-round calendar. Soaring temperatures, extreme humidity and an unforgiving high speed track ensure drivers and cars alike are pushed to their maximum. Throw in the customary monsoon and you have the makings of a long and unpredictable few days. One thing is for certain this weekend; what we saw in Melbourne is unlikely to act as an accurate pre-cursor for the aerodynamically demanding Sepang International Circuit. 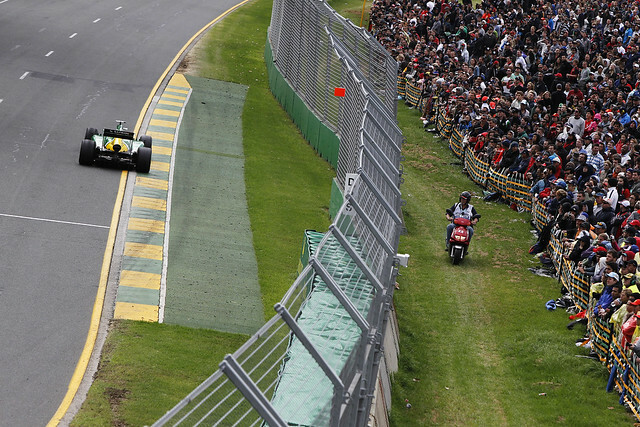 A Red Bull front row lockout at Albert Park, coupled with their seemingly untameable raw speed during all three practice sessions, suggested a quite literal ‘walk in the park’ for Vettel and Webber. As it was, tyre management (or mismanagement, depending on how you view it) came to the fore and balanced an otherwise slightly lopsided playing field. Lotus, along with Mercedes and Force India as other front runners, opted for an ambitious two-stop strategy from the outset. An Adrian Sutil headline-making first stint aside (on his controversial return to the F1 fold), which saw him lead outright for several laps, only Lotus and Raikkonen were able to make the strategy work. This not only serves to highlight the rapidly rediscovered talents of the Finn in his second stint with Formula 1, but also the emergence of Lotus as genuine title contenders in 2013. Their pace was evident throughout the weekend, and the way they allowed Kimi to push as well as conserve in equal measure will not have gone unnoticed in the paddock. Red Bull, though, are unlikely to lose much sleep over a result which saw them notch third and sixth respectively. The race promised much, but having seen Webber plummet to mid-pack from second on the grid after a startline choke (since attributed to a fault with a new electronics device supplied across all teams by McLaren), and Vettel fail to sustain an early lead, they were outwitted and outpaced by both the Lotus and their old foes from 2012; Ferrari. But with Adrian Newey renowned for his sleek, elegant and aerodynamically superlative design, we can expect far greater race potential from the Milton Keynes based team come the weekend. Ferrari too will have cause for optimism. Just one year on from their woeful opening to the 2012 season, when both Fernando Alonso and Felipe Massa wrote-off any genuine challenge of a top six finish or otherwise, the team and both of its drivers are now serious challengers for the season ahead. Having missed out on a first F1 crown since 2006 by a single point at Interlagos in the final round of the last campaign, Alonso and the scuderia have carried substantial momentum with them through the winter off-season and into the new season. Both Alonso and Massa had excellent pace throughout the Melbourne weekend, and with their three-stop race strategy paying dividends, they were able to secure an impressive 2nd and 4th respectively. With their turbulence seemingly buried in the past, Ferrari will have realistic sights firmly set on upsetting the Red Bull applecart evermore. It’s almost as though Ferrari and McLaren have swapped places from the opening round a year ago; with Ferrari floundering at last season’s opener, Jenson Button was cruising to victory in impressive McLaren machinery. Twelve months on and a radical new design, reworked entirely from the same car which won the final Grand Prix in Brazil last term, has thus far looked laborious and severely stunted with regards raw pace. Button’s ninth-placed finish was scant consolation and Sergio Perez’s debut for the British team didn’t offer an insight into his full potential. And whilst they may take solace from Ferrari’s false start to last season, you feel McLaren already has a significant amount of ground to make up on the other heavyweights on the grid; something Button himself recognises won’t come during the week preceding Kuala Lumpur. The former McLaren poster boy, Lewis Hamilton, meanwhile, couldn’t have cut a more contrasting figure from his previous contemporaries. Few last season would have predicted the relative fortunes shared on the opening weekend by McLaren and Mercedes, yet throughout testing and all forms of practice and qualifying in Melbourne the Silver Arrows clearly had genuine pace. However, tyres and strategy would again plague them, and when Hamilton admitted defeat on his two-stop plan, an extra set of rubber put paid to a dream podium debut. Nico Rosberg in the sister Mercedes fell fowl of the other flaw which has also dogged Mercedes’ progress; reliability. But despite their shortcomings, both drivers left Australia in high spirits and buoyed by the team’s evident progress. As for the rest? Well it was a particularly encouraging weekend for Force India who not only led for several laps with Sutil’s longer first stint but also had both drivers vying for final points late on. The talents of both Sutil and Paul Di Resta are abundantly clear but both will know this is a season where they need to make a jump on those around them and close the gap to the front runners in earnest. Sauber had a weekend to forget on the whole; despite relative pace throughout practice and qualifying, team new boy Nico Hulkenberg failed to even make the starting grid after an electrical problem deemed the car unsafe to drive. As for his protégée, Colombian rookie Esteban Guttierez, he will have been pleased to finish his first F1 start in 13th. The team, however, will know better showings are needed ahead if the Sauber’s potential is to be unlocked. But if Sauber’s weekend was tricky then Williams’ was all too concerning. Lacking pace throughout the three days, team lead Pastor Maldonado beached his car at turn one midway through the race whilst running low down the order. His teammate, another debutante in Valteri Bottas, finished but struggled to make his mark on the midfield. Williams have been here before, and very recently too, so they will know what’s required. The big question this time though is whether they can rediscover the form which afforded them a most unexpected Grand Prix win last May in Spain. Toro Rosso looked good in practice and qualifying, revealing some pace in the 2013 model. And Daniel Ricciardo even popped up with a fastest lap mid race as he converted to fresh rubber, but this was a false dawn as he retired from his home race early. As for Jean-Eric Vergne, a twelfth-placed finish reflects the team’s midfield competitiveness and overall reaffirms their current expectations. Toward the back of the grid it was a familiar set up but with new faces all round. Caterham have pinched Charles Pic from near rivals Marussia whilst their second driver is another of the GP2 graduates; Giedo van der Garde. Marussia themselves have added a fourth British driver to the Formula 1 roster in former test driver Max Chilton, and another fresh face in Jules Bianchi. Both teams finished but were staggered in their final positons; Bianchi took the honours whilst Pic, Chilton and van der Garde completed the classifieds. This will be seen as a huge coop for Marussia, but of great concern to Caterham who have promised much in the past and delivered little thus far. If the team’s ambitions of breaking the top 10 and beyond are to be realised then significant strides will need to be made. But regardless of how things panned out at Albert Park on Sunday, caution must be sounded as to early form and progress. Malaysia will deliver much the same in terms of mechanical performance, given that barely five days will have elapsed since the chequered flag dropped in Melbourne, but at this extremely early stage in the season it is almost impossible to predict how cars will evolve and react to differing levels of sensitivity at different circuits. It must be remembered that Albert Park is utilised specifically for the F1 faculty once a year and is run across parkland roads. Thus, tyre degradation will be amplified on the asphalt which is often slippery, dusty and bumpy. Coupled with the ever changeable conditions which hampered the course of the weekend, particularly in qualifying, the variables which dictated team strategy and tyre management were evident. Come Malaysia, a track used all year round and meticulously man-made in 1999, the asphalt will undoubtedly provide significantly more grip and a more balanced reflection of relative performance. Again, conditions and external factors are almost certain to play their part, and predicting a winner in Kuala Lumpur is about as easy as predicting the weather at Sepang come 4pm local time on Sunday. Either way, the chances of that Red Bull applecart being shaken again look far greater than they once were. And with the Iceman, arguably at his F1 pinnacle, who’s to say he or one of his fellow competitors can’t send another shiver down the spines of Horner et al in Sepang. Next ArticleA Kia GTI, really?